This continues a growing tradition of denialist translation. Recently, the director of the World Health Organization Malaria Program, Arata Kochi, has been throwing his weight around by favoring the use of DDT, even where it is not indicated. There have been several posts on this at Deltoid, and an article in the New York Times. In what promises to be an unusually hard-fought and public race, 13 candidates are competing to be the next director-general of the World Health Organization (WHO). The surfeit of contenders means that the process will be even less predictable than usual, say observers, but early signs are that it also may be more open than previous campaigns. While not a leading candidate (yet) Kochi may be positioning himself to step up. They can't make enough tin foil for me. 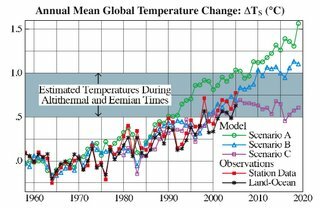 Hansen, Sato, Ruedy, Lo, Lea and Medina-Elizade have published their latest screed on "Global temperature change" in the Proceedings of the National Academy of Sciences. Not bad for a first generation model, and they got a lot of other things right too. Now this does not say the model was perfect, just that it was useful, moreover there are good scientific reasons why it worked, including good physics, and a relatively short period between then and now. Close agreement of observed temperature change with simulations for the most realistic climate forcing (scenario B) is accidental, given the large unforced variability in both model and real world. Indeed, moderate overestimate of global warming is likely because the sensitivity of the model used (12), 4.2°C for doubled CO2, is larger than our current estimate for actual climate sensitivity, which is 3 1°C for doubledCO2, based mainly on paleoclimate data (17). More complete analyses should include other climate forcings and cover longer periods. Nevertheless, it is apparent that the first transient climate simulations (12) proved to be quite accurate, certainly not ‘‘wrong by 300%’’ (14). The assertion of 300% error may have been based on an earlier arbitrary comparison of 1988– 1997 observed temperature change with only scenario A (18). Observed warming was slight in that 9-year period, which is too brief for meaningful comparison. 14 is Michael Cricheton, 18 is Pat Michaels. In the period between 1988 and 2005 CO2 concentrations increased about 30 ppm, or about 1/10th of that equivalent to a doubling. Thus, the higher assumed climate sensitivity (~40% high) would only result is a ~4% difference in the forcing if you assume a linear trend, less if you use the proper logarithmic dependence of CO2 forcing on CO2 mixing ratios. I think Hansen et al are being much too modest. As I said somewhere else, you ask what was the idea global temperature? Well, I guess that depends if you own a mansion on one of the US east coast barrier islands, or a hut in Bangladesh, both of which would be comprehensively flooded on a temperature rise of a few degrees C.
However, recalling that civilization has existed while the global temperature was in a rather limited range, maybe +/- 1 or 2 C from today, I think that the answer is rather clear. Given that the global temperature in recent ice ages was only about 8 C lower than today, I think we have a pretty strong lower bound on that too. Regardless as to your perspective on climate change, this callous statement from a federal administrator who is very visible in the climate science debate should be strongly repudiated by everyone who accepts that the debate should be about the science. I invite Dr. Hansen to expand on, clarify, or correct the comment that he made for this news article. 1. Quoted in Thomas Kuhn, The Structure of Scientific Revolutions (second edition, 1970, Chicago: Univ. of Chicago Press), ch. 12, p. 151. Either you don’t know of this and have lead a very sheltered life, or you do and are merely trying to find a stick to beat Hansen with. I thought better of you. Since this is metastizing, the editorial committee at Rabett Run thought it would be useful to publish this note to make replies easy. * and if you don't recognize that as a play on "Dead Poets Society" you have the soul of an amoeba. It projects out to 2030 that the accumulated global carbon dioxide emissions will be 235 GtC. It also projects that of this total about 15 GtC will come from the use of petroleum in the United States. Let's assume all of this comes from cars. Lets further assume the EPA regulates carbon dioxide such that no emissions are allowed. So he flew on over to find the home page of the US Department of Energy Energy Information Administration, with tons of links, and no data. Eli wants to know where Roger got those facts because a reference to the home page of a site that has thousands of data tables and studies is not exactly helpful for those of us who wish to RTFR. Indeed as far as we here at Rabett Run can tell, none of the commentors at Prometheus even thought to raise the question. This, of course breaks the first commandment, RTFR, but you need to know what shelf it is on, don't you. p 24..Not only is his statement unsupported by his source, but also more significantly, he did not follow the referencing convention that a lawyer or historian citing a lengthy statute for a particular detail normally would follow, which is to pinpoint the precise section number of the multi-section statute that supported his claim. As one will see throughout this report, this general reference to an apparent independent source in its entirety constitutes an unconventional referencing style frequently employed by Professor Churchill to create the appearance of independent support for his claims, while simultaneously discouraging or, at least, making far more difficult, any effort by other researchers to check his claims by failing to pinpoint the precise location of his claimed support in an otherwise lengthy work. We can't tell if the first sentence holds here without knowing where the data came from but RPJr has been known to send folk on snipe hunts and engage in data dumping. 1. An elaborate practical joke in which an unsuspecting person takes part in a bogus hunt for a snipe, typically being left alone in the dark with instructions not to move until the snipe appears. 2. A futile search or endeavor. Cover them in information, so much so that they’ll spend forever trying to wade through this endless detail. It helps to give them good quality information, but if in doubt, you can put low-grade rubbish at the bottom to fill out the pile. If they ask you how you are, tell them, in great detail. If they ask you what you want, give them a pile of differing and conflicting needs. If they ask you how things happen, describe the process in great detail. Anyone who has come up hard and fast against reality understands that there is neither a theory or a model that explains everything. There are always residuals, unexplained anomolies and people on the fringes who will hold onto those for dear life, weaving webs of conspiracy theories that focus only on what remains unexplained. This throws the baby out with the bathwater: the fringe theories might explain the residuals, but they can't deal with the basic facts of the situation. The best theories and models deal with the largest extent of the evidence available using intellectually valid and understandable ideas with predictive power. Those with no tolerence for ambiguity are doomed to a life of carping. The study of elephant droppings is not as interesting as the study of elephants. However, if the elephant dropping salesman, is loud and insistant he can attract an audience, and if someone is paying him a lot of money to attract elephant dropping customers, why, as Barnum said, no one ever went broke underestimating the intelligence of the American public. Tim Ball has sued Dan Johnson for defamation in a letter published April 23, 2006 in the Calgary Herald. Ball wrote to the defendants (not clear if this includes Johnson) May 11, 2006. The writ was issued September 1 in Calgary. What follows is in the spirit of the Holiday Inn Express Lawyer Association of American. Good, now that you have batted the Tim Ball about a bit welcome to the Tim Ball timeline. Now FIRST thing to notice is that Ball was at UWinnipeg from 1971 to 1996, by non-McKitrick like subtraction, that is 25 years. So where are the other three years? Ah, there is a three year gap between Ball's leaving the Canadian Forces in 1968 and being hired as an Instructor. During that time he probably earned his M.A. at the University of Manitoba. So either Ball can't do arithmetic, or he is embellishing. But wait, there are lots of places where Ball says he has 32 years as Professor of Climatology. Hmm, must have taught every year he was an undergraduate, or someone is knitting a sweater. Ball earned his Ph.D. in 1983 from the Queen Mary College of the University of London. There is a gap in his CV, from 1982 or 3 - 1984. That means that his thesis was presented at the latest in December 1983. Ph.D.s require much less time in the UK than in the US. By the current rules of the University of London, the minimum time would be two full years. 6.2 Save as provided in §6.3, the normal minimum period of full-time study shall be two calendar years for the degrees of MPhil and PhD, or the equivalent period of part-time study. 6.3 Students who have transferred from another institution after undertaking research of postgraduate standard in that institution may be exempted by the Graduate School Management Committee from part of the programme of study stated in §6.2, provided that their programme of study at the College shall not be less than 12 months of full-time, or 24 months of part-time study. 7.1.1 The greater proportion of the work submitted in a thesis must have been done after the initial registration for a research degree at the College. Where a student has transferred from another institution, the greater proportion of the work must have been done whilst the student has been registered for a research degree, either at that institution, or at the College. 7.1.2 A student may not submit as his/her thesis one that has been submitted for a degree or comparable award of any other university or institution. This shall not preclude a student from incorporating in a thesis work which has already been submitted for a degree or comparable award of any university or institution, provided that the work so incorporated does not form the major part of the final thesis, and acknowledgement of the earlier work is made on both the student’s entry form and in the thesis itself. Somewhere in Eli's perambutations he saw that Ball was ~57 when he retired. Raises some tin foil hat questions it does. a Nintendo controller alarm clock or perhaps the Yoda back pack? In a Science Policy Forum article entitled "A Road Map to US Decarbonization", (available in part in the Energy Bulletin) Reuel Shinnar and Francesco Citro point out that while nuclear is well suited to support baseload electricity generation, solar is ideal for handling peak demand, being most available, when most needed, during the hot days. Here’s a different way of thinking about the greenhouse effect: that action to prevent runaway global warming may prove cheap, practical, effective, and totally consistent with economic growth. We've been at this pop-stand for a bit over a year. On the whole Eli is satisfied. I think the blog and the Rabett's comments elsewhere have had some effect in moving the climate debate, much more so than the relatively small number of readers would indicate. Rabett Run works well in combination with shorter comments elsewhere, as a place where evidence for this and that can be assembled, a place for the type of very long comment that causes eyes to cross when they are in a comment section, and it recently has become a second home for Ethon after the eagle was kick out of his Rocky Mountain home. And, oh yes, the occasional snark fest. Mustn't forget those. When I saw that John Fleck had Rabett Run on his blogroll as meta-climate I wondered what meta-climate was, but on reflection John had it exactly right. The point of this blog (and many of my comments) is to change the debate not the data, or the interpretation of the data (the models). Eli will take modest credit for showing how language is being manipulated by the denialists, that someone who repeatedly claims to be on your side, may not be, and to have played a part in changing the way in which those who have observed that people are changing the climate address the public and their denialist opponents. In the coming year we would like to start writing about climate biosphere interactions and how global climate affects local conditions. And, oh yes, WGII and WGIII from the AR4. There are a number of webs of interconnected anti-science groups out there. These include the Discovery Institute (anti-science of evolution), the Exxon secrets group (anti AGW), the Tobacco Industry (anti-health effects of tobacco smoke) and many others. I have spent a lot of time following the efforts of most of those groups and trying to connect them together. It has now been shown that a number of anti-environmental groups trying to show that there are no bad effects from a number of well known pollutants (asbestos, mercury, chromium, carbon dioxide, CFC’s etc) are connected through a number of right wing “think tanks” and anti-science web sites. There seems to be a strong Moonie influence with the Discovery Institute and its cohorts, see Jonathan Wells’ cv for proof. While reading through some tobacco related information I came across the interesting finding that Fred Singer once occupied office space in the Moonie Building and has been listed as president of the Moonie Washington Institute of Values in Public Policy. Thus it would appear that there is Moonie influence and money in both the anti-evolution web and the anti AGW web. I would appreciate any further comments on Moonie linkage to the anti-AGW groups. To more or less (mostly more) quote myself, everyone goes on as if there is only data. Analysis with only data is curve fitting. snark: Analysis with only models is string theory /snark. "There are five fundamental modes of oscillation -- three to five years, 10 to 12 years, about 20 years, about 35 years and 45 to 60 years. The (oscillation) modes superimpose, and we get what we get as a function of the year we are in." You could fit a cow with that number of Fourier components. The class at VA Tech was cancelled this semester due to low enrollment. Goal: To provide students with a foundation for future learning that will able them to integrate knowledge of the natural resource disciplines and generate innovative approaches that enhances environmental conditions and sustains ecosystem service for future generations. Esper J., D.C. Frank, and J.S. Wilson, 2004. Climate reconstructions: Low-frequency ambition and high-frequency ratification. Eos, 85, 133,120. Esper, J., E.R. Cook, and F.H. Schweingruber, 2002. Low frequency signals in long treering chronologies for reconstructing past temperature variability, Science, 295, 2250-2253. Intergovernmental Panel on Climate Change, 2001. Climate Change 2001: The Scientific Basis. Houghton, J.T., et al., (eds. ), Cambridge University Press, Cambridge, U.K, pp 881, http://www.grida.no/climate/ipcc_tar/wg1/index.htm. Mann, M.E. R.S. Bradley, and M.K. Hughes, 1998. Global-scale temperature patterns and climate forcing over the past six centuries. Nature, 392, 779-787. Mann, M.E., R.S. Bradley, and M.K. Hughes, 1999. Northern Hemisphere temperatures during the past millennium: inferences, uncertainties, and limitations. Geophysical Research Letters, 26, 759–762. McIntyre, S., and R. McKitrick, 2003. Corrections to the Mann et. al. (1998) Proxy database and Northern Hemispheric average temperature series. Energy & Environment,14, 751-771. McIntyre, S., and R. McKitrick, 2005. Hockey sticks, principal components, and spurious significance. Geophysical Research Letters, 32, doi:10.1029/2004GL021750. Moberg, A., et al., 2005. Highly variable Northern Hemisphere temperatures reconstructed from low- and high-resolution proxy data. Nature, 433, 613-617. Soon, W., and S. Baliunas, 2003. Proxy climatic and environmental changes of the past 1,000 years. Climate Research, 23, 89–110. Von Storch, H., et al., 2004. Reconstructing past climate from noisy data. Science, 306, 679-682. I am sure the Wegman report would have made it in there. The North one, I don't know. You can have just as much fun with the other sections. In magic, this is called forcing a card. "Global warming is real and human beings have something to do with it..."
Any statement that I believe warming is not caused by humans in recent decades is simply not supported by anything I have written or said for a very long time. 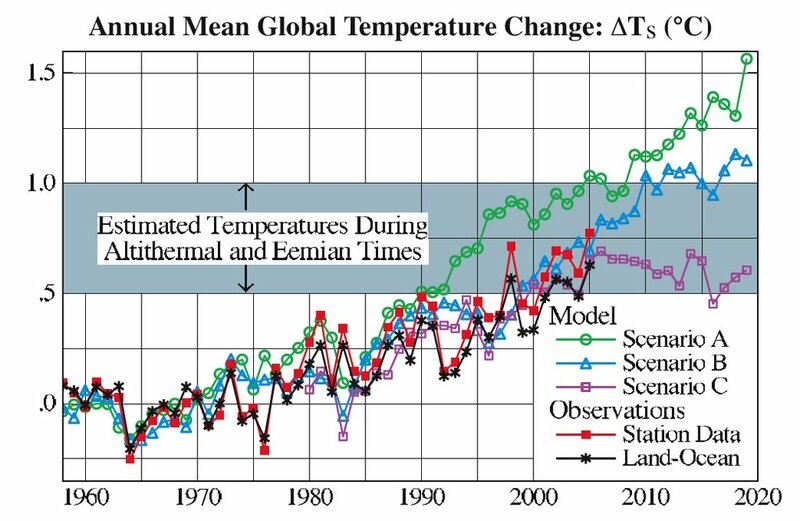 However, in recent years, computer models have improved to the point that we can interface them with observed rates of warming to come up with a confident prediction of future warming. The math works it out to near the low end of projections made by the UN's Intergovernmental Panel on Climate Change, of which I have been a member for over ten years. Having said that, there is no extant policy that can significantly alter the rate of observed warming for at least the next half-century. No one conversant with the scientific literature disputes that. At the same time, humans are adapting. Heat-related death rates have declined significantly in almost all North American cities as they (and the surface) have warmed. I was an author on that work, which was awarded climate "Paper of the Year" by the Association of American Geographers in 2004. Followed by considerable detail, which, among other things argues that paleoclimate changes in CO2 are more likely to be due to warming and cooling of the permafrost rather than carbon being absorbed in the oceans. They conclude that the permafrost is undergoing substantial thawing, and that in particular the large Siberian deposits might disappear by 2100. Because this permafrost is well studied they can make good estimates of how much carbon will be released. Permafrost is a globally significant carbon reservoir that responds to climate change in a unique and very simple way. With warming, its spatial extent declines, causing rapid carbon loss; with cooling, the permafrost reservoir refills slowly, a dynamic that mirrors the past atmospheric record of CO2. In a warmer climate permafrost carbon is thus likely to become part of more actively cycling carbon reservoirs. Factors including high-latitude climate warming should be mitigated to minimize the risk of a potentially large carbon release that would further increase climate warming. So what was the result of the evaluation concluded in early June? The agencies decided to build four satellites instead of the originally planned six and drop five instruments from each satellite. They also chose to swap out an ambitious sensor called CMIS - which would measure ocean wind speeds, among other things - for a less complicated one that has yet to be developed. The scaled-back programme would cost $11.5 billion to develop and launch and would provide polar satellite coverage from 2013 to 2026. The committee also questioned the impact of losing the five instruments - three of which are meant to measure aerosols and other factors important to climate change. Programme managers were asked whether they thought the scaled-back system would have been approved at its budget level if it had been proposed at the beginning of the programme in 1994. NASA chief Mike Griffin answered "I doubt it," and Ronald Sega, undersecretary of the Air Force, said "not in its current configuration". But that will make no difference. Never mind, keep moving.